"Prairie Bonnet" Wins Second Place at the Spanish Moss Miniature Art Show! 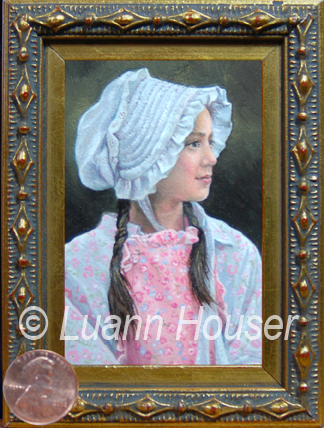 My miniature painting, "Prairie Bonnet" won second place at the Spanish Moss Miniature Art Show in Mobile Alabama. All three of my paintings, "Serenity-Lowlands Gorilla", "Lillies and Lace", and "Praire Bonnet" were accepted into this pretigeous show, and will hang through the month of March at the Mobile Art Council on Dauphin Street at Cathedral Square in Mobil, Alabama. Everyone is invited...I've heard great things about the show, and I'm looking forward to a fun weekend! I was in Columbus, OH Sunday for the art show, "Wings, Scales & Tails", sponsored by the Ohio Midwest Veterinary Conference. I'm pleased to announce that my Oil Painting of a Great Dane, "A Penny For Your Thoughts" won People's Choice! "Silver Lighting on a Frozen Pond - Black Wolf" also had numerous votes, but "Penny" was the winner. Thank You to everyone who attended and for honoring me with your votes!